Students and families of UM’s incoming freshman class had one less thing to worry about as the university unveiled a new full-service moving system that helped ease students into their homes on move-in day. The process, called a “cruise ship moving system,” started before students even arrived on campus. In the weeks prior to their arrival, the incoming freshman class’ CaneLink accounts provided them with a one-hour time frame that they were allowed to move into their dorms. Once students began arriving on campus on Monday, their vehicles were directed to pull up near the Herbert and Patti Wellness Center. Students’ vehicles were then entered into the “system” and pulled through two large white tents lined with cardboard bins. 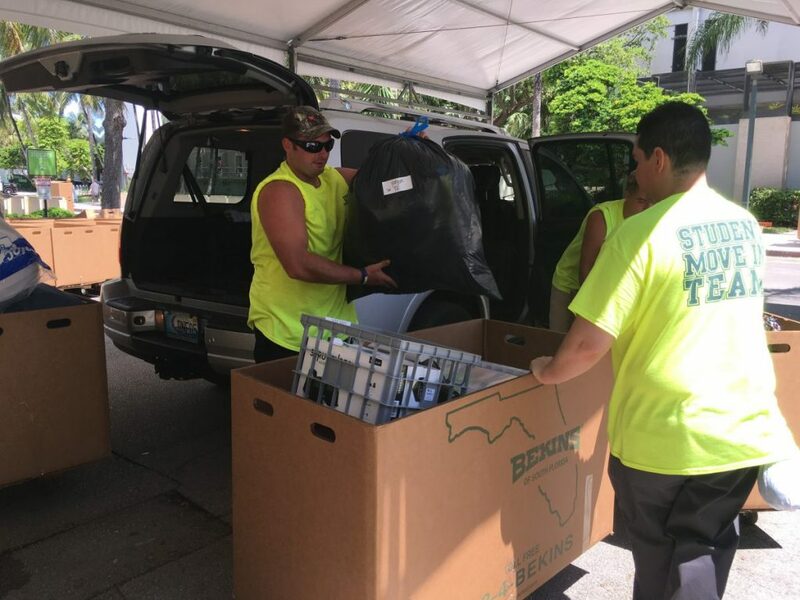 Volunteers from nonprofit organizations and temporary employees, hired by the university for move-in day, unloaded the student’s belongings and placed them in bins. From there, the ‘Student Move In Team’ rolled the bins up to the student’s designated floor and room. Chris West, lead project manager for University Student Services, said the system was designed to control traffic across campus before and after the unloading took place. “We are not only unloading things and moving them into a building, but we’re controlling traffic…we’re making sure that empty cars, after being unloaded, are going in the same direction, to the same place, so that they can park,” West said. He said the university will provide the service this year at Eaton, Stanford and Hecht Residential Colleges. Stanford and Hecht house freshmen only, while Eaton is a mix of freshmen, transfer students and upperclassmen. In the past, the university has provided students and their families with bins that could be checked out during move-in day for a couple of hours. However, the move-in process was left almost entirely up to the families. “Essentially, the headache and the chaos that I understand a typical move-in day could be — we’re putting some organization to it,” West said. According to West, throughout the day he received positive feedback about the new move-in process from both students and parents. For Bryanna Desimone, an incoming freshman from Melbourne Beach, Florida, the move-in process “was the easiest thing” she’s ever done. Though many described the move-in process as “easy” and “a big relief,” some students expressed nerves about the following days of Orientation and the first day of school. Jackie Verge, a freshman from Westchester, New York, said though she was excited about the different opportunities and lifestyle UM would offer her, she was still nervous about starting school. “I’m most nervous about making new friends and meeting all the new people. I’m also really nervous about my classes because I’m taking physics,” said Verge, an engineering major. Liang Haixin, an international student from China who moved in with just one full-sized suitcase, expressed similar sentiments. Haixin said he was nervous about making new friends but looked forward to the challenge of studying in a different country.